It has been an absolutely spectacular week here in southeast England, which has lifted the spirits of all concerned. Except for on the way home from school, when the girls moan about it being "Toooooo hoooooot Mummy!" The poor things, you'd think they'd never lived in Hell Houston. Still needed: weaving in of many ends (damn stinkin' hemp yarn with lots of knots!) and a good wet blocking. Maybe tonight. I've also gone on a total run and done a bunch of dyeing. 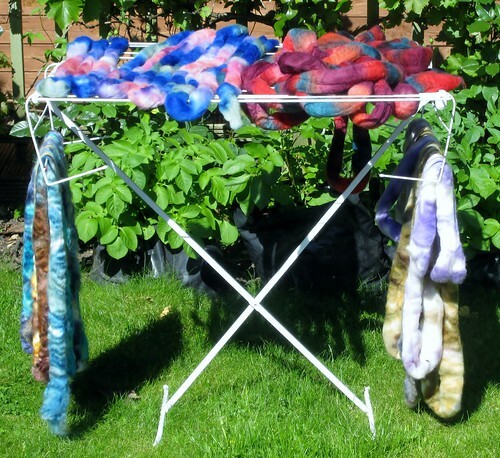 That's four out of six colorways drying in the glorious sunshine. The other two will be joining them in the next few hours, and I'm hoping to get an update posted on Sunday afternoon. As long as the weather and the photography gods smile on me! I hope everyone has a glorious, sunshine filled weekend! 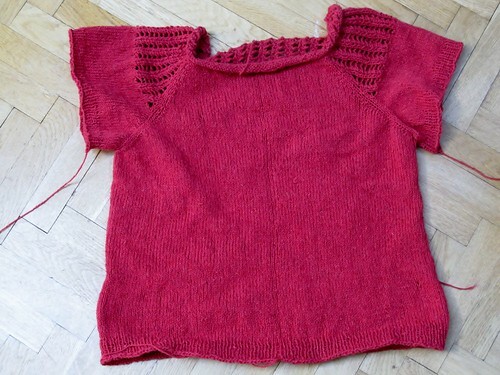 Written by porpoise On May 25, 2012 In "Porpoise Fur", "dyeing", "sweaters"